HAZEN, MOSES, army officer, office holder, landowner, seigneur, and merchant; b. 1 June 1733 in Haverhill, Mass., third child of Moses Hazzen, merchant, and Abigail White; m. 5 Dec. 1770 Charlotte de La Saussaye in Montreal, Que. ; they had no children; d. 5 Feb. 1803 in Troy, N.Y., and was buried 8 February in Albany, N.Y.
Moses Hazen enlisted in an American colonial unit in 1755 and, according to the historian Francis Parkman, served that year under Lieutenant-Colonel Robert Monckton* at Fort Beauséjour (near Sackville, N.B.). In 1756 he was at Lac Saint-Sacrement (Lake George, N.Y.). Out of the army the following year, he shipped to Halifax provisions and supplies for the projected British attack on Louisbourg, Île Royale (Cape Breton Island). 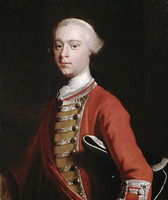 On 7 April 1758 he was commissioned first lieutenant in John McCurdy’s company of Major Robert Rogers*’s rangers, and he served under Brigadier-General James Wolfe* at the capture of Louisbourg. Wintering at Fort Frederick (Saint John, N.B. ), and having succeeded in January 1759 to command of McCurdy’s company, Hazen led it the following month on a raid to Sainte-Anne-du-Pays-Bas (Fredericton, N.B. ), burning the settlement and taking prisoners, among them Joseph Godin*, dit Bellefontaine, dit Beauséjour, who had been a thorn in the British side; the raid earned Hazen a captaincy. In 1759 Hazen’s company was included in the expedition to Quebec, and he transferred to that front Rogers’s form of brutal partisan warfare, boldly volunteering himself and his men for numerous expeditions into the countryside around Quebec. He was on one such operation when the battle of the Plains of Abraham was fought on 13 September. 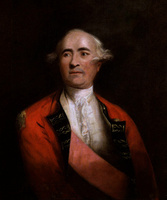 As the British waited out the winter of 1759–60 within the walls of Quebec, Hazen’s daring sorties impressed Brigadier-General James Murray*. Badly wounded in the thigh at the battle of Sainte-Foy in April 1760, Hazen was eventually obliged to give up his ranger company. On 21 Feb. 1761, with the recommendation of Murray, who attributed to him “so much still Bravery and good Conduct as would Justly Entitle him to Every military Reward he Could ask or Demand,” Hazen was allowed to purchase, for 800 guineas, a lieutenant’s commission in the 44th Foot. 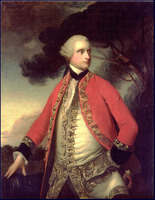 From 1761 to 1763 his regiment performed garrison duty at Montreal, and when it was reduced to nine companies in 1763 he retired on half pay. Hazen settled at Montreal, and in 1765 he was appointed by Murray a justice of the peace. Two years later he was a member of the grand jury in the Thomas Walker* assault case. Meanwhile he had begun acquiring land for settlement and speculation. In the early 1760s he obtained proprietary shares in two towns in New Hampshire and the grant of another town, later known as Moortown (Bradford, Vt). In 1764 he was among the British officers and associates who formed a company, later known as the Saint John River Society, to acquire vast tracts of land in the Saint John valley (N.B.) [see Beamsley Perkins Glasier*]. The same year Hazen and Lieutenant-Colonel Gabriel Christie* jointly purchased the seigneuries of Sabrevois and Bleury on the east bank of the Rivière Richelieu and five farms on the site of Saint-Jean (Saint-Jean-sur-Richelieu). The two men thus became masters of the rich upper Richelieu valley. With Christie furnishing most of the capital, but absent for long periods, Hazen strenuously developed their holdings, clearing lands, settling tenants, building two sawmills, and erecting a manor-house at present-day Iberville. An appointment by Murray in 1765 as deputy surveyor of the king’s woods facilitated Hazen’s entry into the timber business. The following year he signed a personal agreement with Samuel McKay, deputy surveyor for the navy in Canada, and a London naval supplier, John Henniker, to provide a large number of masts. Standards for masts were sufficiently high that it was probably necessary to cut on property to which Hazen and McKay did not have title, and when in 1767 they floated 200 logs from the Lake Champlain area to Montreal, the timber was seized by Benjamin Price* and Daniel Robertson as having been cut on their land. From 1766 Hazen was in and out of court on a number of commercial matters. That October a Saint-Jean merchant, Joseph Kelly, published in the Quebec Gazette a letter accusing Hazen of having “villainously seduced” his wife while he was absent on business in July, and then of having had him imprisoned at Quebec for a non-existent debt when he had come there to obtain redress. By 1766 Hazen’s expensive development schemes had provoked Christie to impose stringent restrictions on the activities of his fast-moving, ambitious partner, who, however, tended to interpret them after his own fashion. 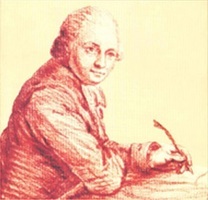 He incurred large debts on the seigneuries, and in 1766 he mortgaged his half of them to Christie for £800. He continued to borrow heavily and obtained £2,000 from his brother William and William’s partner, Leonard Jarvis. In 1770 Christie insisted on a division of their property. Hazen got land in and around Fort St Johns (Saint-Jean-sur-Richelieu), a farm near by, and the southern half of Bleury, including the manor; he thus became seigneur of Bleury-Sud. That fall some of his goods and livestock were advertised for sale at a sheriff’s auction, and the following spring another sheriff’s auction of land was advertised in order to pay a debt owed to Joseph Fleury* Deschambault. These set-backs did not prevent Hazen from pushing ahead the development of his seigneury, on which he built a forge, an ashery, and a second sawmill to replace one lost to Christie in the division of properties. In 1773 he petitioned Governor Guy Carleton for a large tract of land adjoining Bleury-Sud to the east as well as for a seigneury for his brother William and another for Jarvis; none of these requests was granted before the outbreak of the American revolution in 1775. 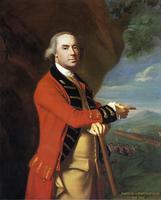 Alarmed at the first news of open rebellion in the colonies to the south, in February 1775 Hazen visited Carleton at Quebec; the governor, describing him as a brave and experienced officer, recommended him for a commission and in March sent him with dispatches to Lieutenant-General Thomas Gage* at Boston. Two months later Hazen brought Carleton word of Benedict Arnold’s incursion to Fort St Johns. He then returned to his seigneury and, since his lands lay along a probable American invasion route, he spent the summer pondering his situation. Temperamentally Hazen was incapable of remaining neutral, but his decision as to which side to join would be based in good part on the prospects of success of each of the contending parties, and hence on the ultimate disposition of his properties. In the fall of 1775 the Americans began a two-pronged invasion of Canada, one force entering the colony via the Richelieu valley [see Richard Montgomery*]. It had first, however, to retake Fort St Johns, where the defences had been stiffened under Major Charles Preston. Hazen was sent an authorization from Carleton to raise troops and to join Preston, but, as yet unsure of which side to adopt, he equivocated. Perhaps hoping to stave off the invasion, which could only wreak havoc on his lands, instead of reporting to Preston he visited the American commander, Philip John Schuyler, and told of bleak prospects for American success. As a result, a council of war decided to abort the invasion, but it reversed its decision when James Livingston, an American established at Chambly, described the situation in a far more optimistic light. Because of his equivocal behaviour, Hazen was arrested by an American detachment. It was obliged to abandon him, however, by an approaching British force, which arrested him in turn. Preston sent Hazen to Carleton at Montreal, where he was placed in close confinement after, he later claimed, having refused Carleton’s offers of the command of a British regiment or retirement to Britain for the duration of the war. Following the capture of Fort St Johns on 3 November, Carleton was obliged to depart Montreal precipitously for Quebec; he took Hazen with him, but, when nearly captured en route, had to leave him to the Americans. Hazen, now obviously committed to the American side, joined in the siege of Quebec. After the failure on 31 Dec. 1775 of Montgomery’s desperate attack on the city, Hazen and Edward Antill, an American resident of Quebec who had been expelled by Carleton, were sent to the second Continental Congress at Philadelphia with the news of Montgomery’s death and a request for reinforcements. Congress decided to raise two Canadian regiments of 1,000 men each. Command of the first was given to Livingston, and that of the second, with the rank of colonel, was offered to Hazen. His reticence to accept was overcome by a guarantee of compensation for loss of his British half pay and assurances that his Canadian property would not be confiscated by the British since the American invasion could not fail. Hazen returned to Montreal and began recruitment in competition with Livingston, offering the equivalent of 40 livres for enlistment, plus monthly pay. One of his recruiters in the Richelieu valley was the merchant James Bell. At first Hazen enjoyed success with the disaffected Canadians, but recruitment fell off as a result, Hazen asserted, of bad behaviour on the part of American troops and civilians in Canada, the paucity of troops in the colony, and payment in paper money and certificates that the quartermasters subsequently refused to redeem. By the end of February Hazen had 150 soldiers; a month later he still had only 250. Even the hiring as chaplain of the Jesuit Pierre-René Floquet*, in an attempt to overcome the church’s discouragement of recruitment, failed to have much effect. In late March 1776 Hazen took command of Montreal, when Brigadier-General David Wooster was ordered to replace Arnold before Quebec. Soon after his arrival at Montreal, Arnold sent Hazen to take command at forts St Johns and Chambly; Hazen was also to prepare the American line of retreat along the Richelieu valley. His experience with the Canadians prompted him in May to write Brigadier-General John Sullivan, who was preparing a last stand at Sorel: “Do not rely on any real assistance from the Canadians whom you are collecting together – I know them well; be assured that, in our present situation, they will leave us in the hour of difficulty. . . . What are we to expect from a handful of such men, against the well-known best troops in the world?” When Hazen joined the retreat from Canada in June, of the maximum of 477 men that he claimed to have recruited, only about 175 followed him. Hazen’s regiment remained intact throughout the revolution, supplemented by recruitment from the American states. It saw action at Staten Island, N.Y., Brandywine and Germantown (Philadelphia), Pa, and Yorktown, Va, earning an excellent reputation. 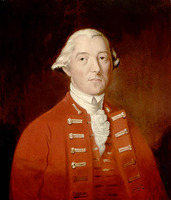 Hazen’s was among the most insistent voices for a second invasion of Canada, and in January 1778 he was appointed deputy quartermaster general for an invasion force to be led by the Marquis de La Fayette; the project was abandoned, however, on 13 March. In September 1778 Hazen launched yet another campaign for an invasion of Canada [see Sir Frederick Haldimand] and the following year Hazen’s unit built a prospective route, called the Hazen Road, across northeastern Vermont toward Missisquoi Bay, but the second invasion never took place. 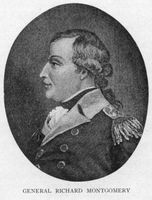 Hazen fought for the promotion and the prerogatives of his men by repeated petitions to General George Washington and to Congress, but succeeded only in obtaining a brevet promotion for himself to brigadier-general in 1781. Hazen’s men were furloughed in June 1783 and the regiment disbanded in November. His Canadians joined their families in refugee camps at Albany and Fishkill, N.Y., where they received rations from Congress; some drifted back to Canada [see Clément Gosselin]. Before the end of the war Hazen had tried to get land grants for them, and, although Congress had failed to take action, the state of New York created the Canadian and Nova Scotia Refugee Tract along Lake Champlain. In 1786 the refugees moved to their new lands. After the war Hazen fought a running battle with Congress for compensation for his losses in Canada, for his disbursements to recruit and maintain his regiment, and for loss of his British half pay. His estate had been pillaged by both armies, and during the retreat of 1776 his manor had been razed to deny it to the British. In 1783 the Saint John River Society’s lands, including Hazen’s share, were escheated. The following year Gabriel Christie won a suit against him in the Court of Common Pleas at Montreal, obtaining judgement for £1,900 sterling. He had Hazen arrested twice at New York for debt and in August 1785 had his Richelieu valley holdings seized for sale at sheriff’s auction. Hazen won on appeal but saw the decision reversed by the British Privy Council. In 1790, at a sheriff’s auction, Christie acquired Bleury-Sud and some of Hazen’s other lots around Fort St Johns. In spite of his debts and set-backs Hazen had extensive plans for land speculation and colonization in the United States; all came to naught, particularly after a stroke in 1786 disabled him for life. In 1787 he settled at New York, but then moved to Troy. In the years following the war he enjoyed cordial business relations with James Bell in Canada. By 1790, however, after unsuccessfully petitioning Congress for years to reimburse $6,000 of personal funds advanced for the American cause, Bell sued Hazen for $826 of advances that Hazen had guaranteed. Having won his suit, in 1794 Bell had attached part of Hazen’s lands in Clinton County, N.Y., including 1,000 acres in the Refugee Tract and a model farm, which Hazen had been developing on the shores of Lake Champlain. In the last 20 years of his life Hazen was arrested 14 times for debt, and he instituted as many suits against others. A court adjudged him of unsound mind in 1802; nevertheless, he was arrested twice for debt only weeks before his death on 5 Feb. 1803. On paper he died a wealthy man, but his widow was unable to collect claims totalling $42,000 against Congress and individuals before her death in 1827; the executor of Hazen’s estate ultimately obtained payment from Congress of some of the claims. As a soldier Moses Hazen displayed extraordinary leadership qualities. A combative man, he was happiest in action. Courageous and impetuous, he was also throughout his life restless, frustrated by obstacles, stubborn, and hypersensitive about his honour; in 1790 Secretary of War Henry Knox referred to him as “the unfortunate Hazen . . . , nature has marked him with as obstinate a temper as ever afflicted humanity.” A driving man, Hazen was even more a man driven by the need to be in motion, but he never established a sense of direction. For a detailed bibliography on Moses Hazen see A. S. Everest, Moses Hazen and the Canadian refugees in the American revolution (Syracuse, N.Y., 1976). The following sources are also useful: “Inventaire des biens de Luc Lacorne de Saint-Luc,” J.-J. Lefebvre, édit., ANQ Rapport, 1947–48: 62; “L’outrage Walker, 1764,” PAC Rapport, 1888: 14; “Pierre du Calvet,” J.-J. Lefebvre, édit., ANQ Rapport, 1945–46: 367; Vital records of Haverhill, Massachusetts, to the end of the year 1849 . . . (2v., Topsfield, Mass., 1910–11), 1: 167. Allan S. Everest, “HAZEN, MOSES,” in Dictionary of Canadian Biography, vol. 5, University of Toronto/Université Laval, 2003–, accessed April 20, 2019, http://www.biographi.ca/en/bio/hazen_moses_5E.html.